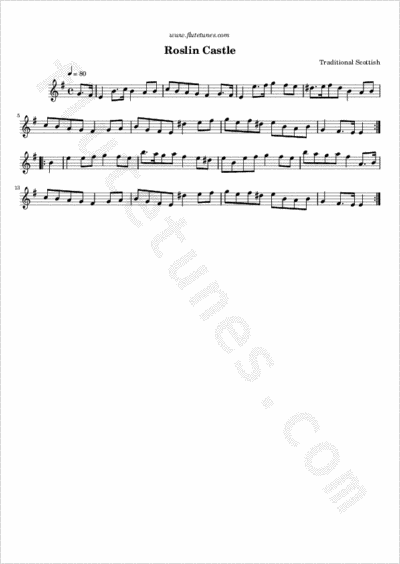 This slow air is often attributed to Scottish music publisher, composer and dancing master James Oswald, who published it in his 1746 collection The Caledonian Pocket Companion. However, it is not marked as his tune, and it had appeared a few years earlier in William McGibbon's collection under the title “The House of Glamis”. The air was used as a marching tune by the British army during the American Revolutionary War period. In his book Military Music of the American Revolution, Raoul Camus writes that the tune was the melody most often associated with funerals during the Revolution, and notes that legend has it that it was played by Scottish bagpipers stationed in New York at the time, in honor of the castle at Roslyn, Midlothian, Scotland. It was perhaps in a funereal state of mind that British troops in 1781 played the tune as they marched out the small Long Island, New York, village of Hempstead Harbor. The oppressed residents, however, rejoiced at the sound, and remembering this, in 1844 their descendants changed the name of their village to Roslyn.